The difference: The Luxury Well is a team of people that love and collect watches - we are not just another secondary market dealer but we want to forge long lasting relationships with our clients and provide genuine consulting and sales services that surpass even the most discerning collectors expectations. 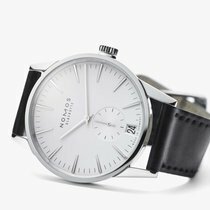 The Luxury Well can source any Nomos model for you that is not sold out. Today, we are offering a brand new and unworn Made in Germany Nomos Zürich World Time Midnight Blue, Ref. 807, with all boxes and papers and full warranty. This is a genuine Nomos Glashütte watch and we guarantee authenticity. This is a rare watch for the ambitious entry level watch aficionado, impeccable in manufacturing and finish and a true statement piece for beginning and intermediate collectors. Current Retail price for this model is $6,100. The watch comes with the original Nomos black Cordovan Sheel strap and with the original Nomos stainless steel tang buckle. This timepiece is sourced directly from Nomos. The watch comes with full warranty and retail stamp from a US authorized retailer. PLEASE NOTE: UNLIKE CHEAPER OFFERS THIS WARRANTY IS AN AUTHORIZED RETAIL WARRANTY WITH FULL INTERNATIONAL VALIDITY. The watch is brand new and unworn and free from any blemishes. The exact condition of the watch can be seen in the pictures. The watch runs perfectly fine to specifications. Please make sure to also check our YouTube channel "The Luxury Well" for a video that shows the factory fresh condition of this watch in great detail. Please note that Shell Cordovan leather has natural stains so that the back of the strap might appear stained but that is a normal effect to be expected on this watch. Description: Travel the world—and time itself—at the push of a button: With this elegant version of Zürich world time in midnight blue, traveling is so much more fun. This multilingual automatic watch knows the time almost everywhere, and will tell you the time in a click—in Rio or Hong Kong, Karachi or Dubai. A watch complication made simple. This automatic caliber is equipped with a world time and 24-hour display. As well as a proprietary escapement, the NOMOS swing system. Produced in our Glashütte workshops according to the traditions of the watchmaking craft, this caliber tells the time with precision—both at home and in 23 other time zones. Silver-tone stainless steel case with a black leather strap. Fixed silver-tone stainless steel bezel. Galvanized; blue dial with silver-tone hands and index hour markers. Minute markers. world time cities around the outer rim. Dial Type: Analog. Small seconds and 24-hour indicator subdials. Nomos Calibre DUW 5201 automatic movement with a 42-hour power reserve. Scratch resistant sapphire crystal. Pull / push crown. Transparent case back. Round case shape, case size: 39.9 mm, case thickness: 10.85 mm. Tang clasp. Water resistant at 30 meters / 100 feet. Functions: second time zone, hour, minute, second, world time. Additional Info: leather strap is made of shell cordovan. Casual watch style. Watch label: Made in Germany. 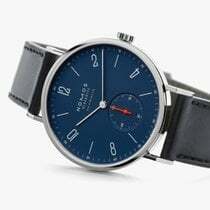 Nomos Zurich Weltzeit Nachtblau Blue Dial Mens Watch 807. Buy with confidence as the watch shown in the pictures is the actual watch up for sale (including the beauty shot that we took). Any material deviation from any of these representations entitles the buyer to a return of the watch. We also include free shipping with FedEx to addresses in the continental U.S. as well as low rate 2nd day and overnight express options and international shipping at affordable rates. For further questions, please never hesitate to contact us.